Screen resolution can be adjusted while playing windowed. Enable windowed mode and use the -popupwindow parameter (or see the glossary page). ON and OFF are the only settings available on the menu options. 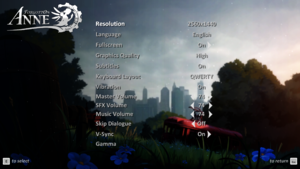 Gamma can also be adjusted with a slider from the menu options. 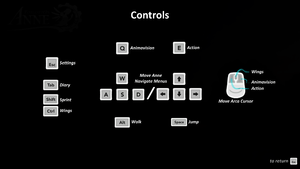 Only an image of the control's layout is presented under HELP/CONTROLS. No adjustment options are available. Not adjustable from the menu options. Menus are navigated with the keyboard only. The Keyboard Layout can be set to QWERTY and AZERTY from the menu options. Master Volume, SFX Volume and Music Volume. Game also pauses when window focus is lost. The MacOS listing is based on the GOG release. Steam lists OS X 10.9 (Mavericks) as the OS minimum requirement. ↑ 2.0 2.1 File/folder structure within this directory reflects the path(s) listed for Windows and/or Steam game data (use Wine regedit to access Windows registry paths). Games with Steam Cloud support may store data in ~/.steam/steam/userdata/<user-id>/542050/ in addition to or instead of this directory. The app ID (542050) may differ in some cases. Treat backslashes as forward slashes. See the glossary page for details. 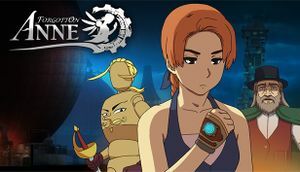 ↑ Forgotton Anne is out now! ↑ Forgotton Anne is out on Mac! This page was last edited on 23 April 2019, at 11:22.